Heart Support was founded by Jake Luhrs of August Burns Red. We were able to talk with Jake about his inspiration behind starting Heart Support, what it is, a new program they are kickstarting and ways to become involved. Nathaniel: What inspired you to start Heart Support? Jake: In 2006, when I started with August Burns Red, I would go to the merch table and talk to kids shake their hands and say thank you, talk to them about the show or whatever they wanted to discuss. A lot of times they would end up saying how this song helped them overcome heroin, addiction, their parents’ divorce, being sexually assaulted. You hear stories about people who are going through a lot of hardships and how our music and lyrics has helped encourage them. I was sitting outside one day in Chicago, talking to God saying how thankful I was to be in this band and have the opportunity to help kids, have all these fans and everything he had given me. I asked and prayed if there was any way I could give back and the idea of Heart Support came to mind. I wrote everything out that was coming to mind: what Heart Support was going to look like, what it was going to have for the kids, how I was going to be able to facilitate it. That’s where I started. I made cards for when I was talking to kids at the merch table about some serious stuff I would give them, basically a Heart Support card, saying come here and talk about the things that are deeply wounding you and then I would try to help encourage them to get over it and find healing. Josiah: Is it cool to see songs that you have created reach out and really help somebody? Jake: Yeah! That’s what kind of what bridged the gap for me to make the connection that these kids need something more. The music is great and the shows are fine, they’re fun you know. Kids will get excited and something will click at a show, but then I leave. I can encourage them while I am there, but then once I leave there’s nothing.. they still go home to the same problems, they still live in the same environment. That’s why Heart Support is online, so that they can connect at their home with other kids that may have struggled with the same things. The lyrics were definitely the starting point of making that connection with kids so they can relate to me personally. It kind of gives us this personal connection that they feel that they can open up to me. Nathaniel: You guys have interviewed tons of different bands for Heart Support, what is like working with other bands that don’t have the Christian perspective that you have? Jake: It’s fine. There’s no problem there. They know what we’re doing, they know that I am a man of faith and that doesn’t get in the way. The guys who do interviews with us they understand the love that I have and where Heart Support was birthed from was based off of my Christian faith. The other thing is when I met Jesus he accepted me right then and there for who I was.. didn’t matter if I was struggling with alcohol or messing around with girls. I want to portray the same love and grace that he has for me for these band guys and for the kids that come to Heart Support, it’s just nothing but love. When they see the genuineness behind this movement that I am doing, they respect me for it. A lot of guys are like hey you know I’m not a Christian, I don’t believe in God at all, but you are doing is great so however I can help you and support you I want to do that. It’s actually great. It’s an opportunity for them to love people, it’s a chance for us to love them. It’s a good relationship. Nathaniel: Has this been able to open doors with bands in the case of spreading the gospel to them? Jake: Yeah! There’s definitely some guys that aren’t faith-based that I’ve had good, intimate, personal conversations with.. I think that Heart Support isn’t that leeway for the bands, I think me, personally, is that connection for the bands. These band guys don’t know Heart Support, they know me. If there’s anytime where they want to open up about faith or have questions they know they can come to me and I’m not going to judge them. I too may not have the answer. I’ll do some research, things like that and we can grow together, in finding answers to some questions. Everybody’s really respectful of each other. Nathaniel: You guys are fundraising right now for a new addition to Heart Support, can you tell us about that? Jake: It’s a program. It’s a six step program, it’s actually custom built by Heart Support team and I. It’s called the Restore Program. It’s for kids to take in the convenience of their own home, to figure out wounds in their life, where those wounds started, how they created habits and really understanding the core belief of who you think you are and seeing what those habits have created in your life.. and then trying to find healing for that wound so that you can break those habits and start to form a new core belief and understanding of who you are in order to overcome those past wounds. Each step has an interview with a musician in our genre. Levi Benton from Miss May I, Bless the Fall, Black Veil Brides’ singer, Andy from We Came As Romans. Each interview they tell their story or one of their stories and then I have a table discussion with my team and break down each step.. what that looks like in our lives, what it might look like in Andy from We Came As Romans’ life and things like that. There’s a workbook with a questionnaire for kids to think about and respond to with each step. Right now we’re just doing a fundraiser, we are trying to raise $10,000.. we’ve actually raised $9,000 at this point. We have a lot of cool rewards.. it’s like a kickstarter kind of thing. You can donate $250 and maybe get a dinner date with a band guy or maybe a merch package or something signed buy a band. There’s Pierce the Veil stuff, the Word Alive, August Burns Red, the Color Morale merch. There’s a bunch of bands that decided to donate some of their things in order for us to be able to get this money because Heart Support is a non-profit. I personally don’t make a salary. I do this and I have two employees. Those guys individually go out and find their own donors. The money that’s being raised is going strictly straight to Heart Support so that we can run it and build this program. It’s mental health, it’s all about really trying to help these kids. The program when it’s released is going to be maybe $50 and that’s really not a whole lot as far as what you’re getting and the material. We really want to help these kids. If we want to get real with it, I’ve poured my life into this scene for ten years. I started when I was sixteen and these are like my kids. This is the scene and I want to change it. I want to make it stronger, I want to make it healthy. I want to give these kids something that will last in their lives, not just a lyric. Nathaniel: Is there anything else you would like to say about Heart Support, any other ways people can get involved? Jake: You can do volunteering. If you want to volunteer, your time or you think that you’ve got something that would be beneficial to the community you can email info@heartsupport.com. 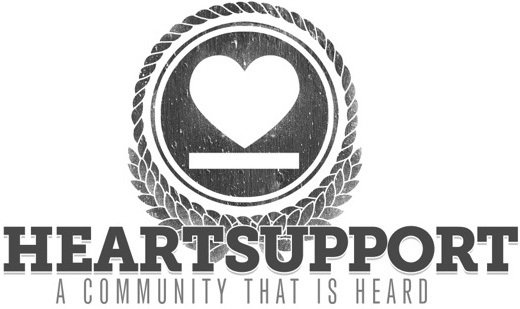 Again to clarify what Heart Support is.. it’s an online community for no one in the scene to struggle alone. There’s a forum for kids to write out what they’re going through or to tell their story of struggle.. and they can do that anonymously. 10,000-20,000 kids a month will come to the site and encourage you. We do interviews with musicians to talk about their stories, how they’ve overcome those things and their message of hope. We’ve got this program that we’re going to be rockin’. It’s a place for people to be safe and no judgement. Doesn’t matter the color of your skin, what you believe in, who you’re in love with, what you’ve done or what’s been done to you.. we’re accepting of everyone. Check it out, if it’s something that is beneficial to you then keep coming. Nathaniel: Appreciate your time and what Heart Support is doing!